This dish can be served as a salad or main dish over rice or riced cauliflower. The shrimp can be prepared however you wish, I tend to bread them with tapioca flour and deep fry (because with whole 30, it’s nice to get some crunch every now and again) but you could also sauté or grill. Takes about 15 minutes to make and serves 2-4, depending on portion size. 1 honeydew, deseeded and cut or balled into bite sized chunks. If you’re frying the shrimp, heat about 1″-2″ oil in a a deep pan. While oil is heating up, mix dressing ingredients. Mix tapioca and salt together on flat plate. Whisk egg in a flat bowl. Dip each shrimp in tapioca, then egg, then tapioca again. Drop coated shrimp into oil and cook until coating is browned, shrimp is pink and curled, flipping once. (This happens really fast, about 3 minutes.) Rest shrimp on cooling rack or paper towel until all are done. 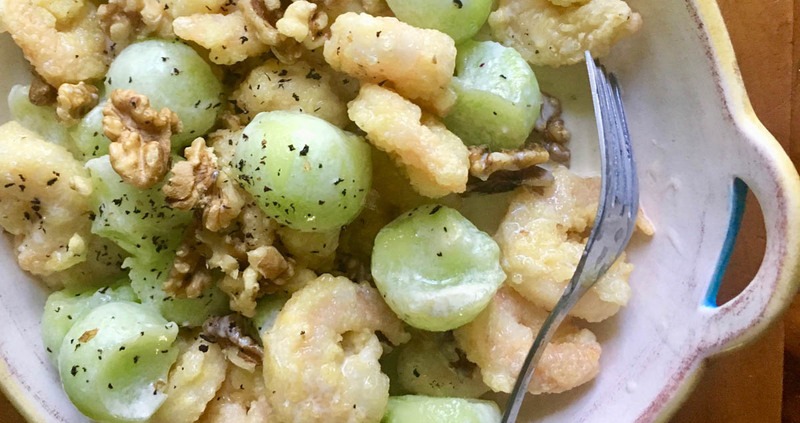 Toss shrimp, walnuts and honeydew together and serve.